Every step we take follows another. Every step we take precedes another. The smallest shifts—doing some dishes, putting something away, stopping something, starting something, taking a shower—can all be significant events on a continuum of ‘next steps’, representing our unique pathways through life. As well-intentioned as this practice may be, and as useful as having a goal or aspiration may be, both worker and client can expect big things to be achieved quickly, and yet they may find it hard to get things going. It’s a bit like, ‘Well, we both know what your goals are, let’s just do it!’ Pretty soon these big picture goals seem to get further and further away, ‘progress’ can feel slow or non-existent, and blame can set in for both client and worker. On top of this, ‘blank slate’ practice can creep in. This revolves around the concept that someone is starting from an underdetermined beginning—an assumption that can make any step towards the long-term goal seem monumental, or at the very least, hard to achieve. Blank slate practice also encourages workers to think they are somehow responsible for that so-called first step and, quite possibly, that it might not happen without them being involved. Before you know it both worker and client are blaming either themselves or each other for not making big changes or achieving ‘outcomes’. I started wondering: What could we do that would support both the people we work with (clients of family services, youth or mental health programs) and ourselves as workers, to identify and celebrate the small, next steps that have been, or could be, taken towards long-term goals? What could we do to place the means for the conversation in the hands of the people we work with? What would be a practical, simple and easy-to-use tool that captures the elements of change that are achievable or doable almost immediately? And so Next Steps was born. 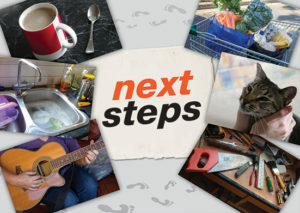 Next Steps is a resource that attempts to capture the power and purpose behind the simplest of immediate steps one can take on a longer journey. It contains 52 cards made up of 48 colour photographs and four timeframe cards. The idea for Next Steps arose directly from my practice both as a mental health support worker and manager of mental health programs for St Luke’s Anglicare (now part of Anglicare Victoria). The people who accessed these services were doing their best to cope with what the extremes of life and their mental illness were throwing at them. At a time when they were struggling to come to grips with the intensity of their lived experience, often we as workers would encourage them to come up with some long-term goals to aim for. Sometimes these goals would be decided for them.